One more new feature has just been added to the advanced settings for our website speed tests, as for our monitoring and comparison features: the DNS Mapping. Thanks to this new option, you can now enforce one/many DNS resolutions. Let’s see why and how to use such a feature through a few examples. DNS resolution: what does it mean? To access a website, your web browser usually rely on a domain name, corresponding to the website address. This domain name translates to an IP address (or several) that will be used to communicate with the web server. As the web browser does not know the related IP address, it will first request a DNS server (kind of big directory for the browsers) to resolve the domain name and get back the IP address. This process is applied for the web page main address as well as for all the subsequent resources located on a different domain. Besides, you’ll notice a DNS Lookup time appearing within the waterfall of our test reports, corresponding to this process. Why would you need to override DNS resolution results? When you launch a test with Dareboost, a Google Chrome instance browses the web page you asked for. Whereas your visitors generally rely on the DNS server of their Internet Service Provider, Dareboost uses the Google’s one (anybody can also use it). Your website infrastructure is complex, based on several servers. Thanks to the DNS Mapping option, you can force the test to use a specific server. 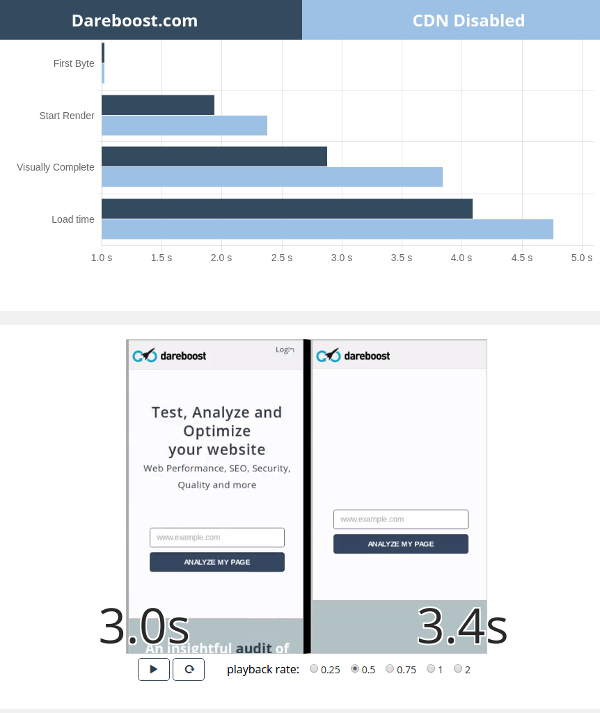 You would like to benchmark several CDN providers: so you can test each of them and choose the faster one. Don’t forget to use our various test probe locations to do so! You can also simulate a failure of an third-party service or a corrupted DNS server and then anticipate the consequences for your website usability. Let’s conclude with a concrete case: here are the settings we have used to test our own website, based on the Amazon Cloudfront CDN. On one side, we have tested the “standard” version of Dareboost.com from the USA. On the other side, we have tested it (still from the USA) with our CDN disabled, by replacing the Cloudfront domain with our own server IP address. 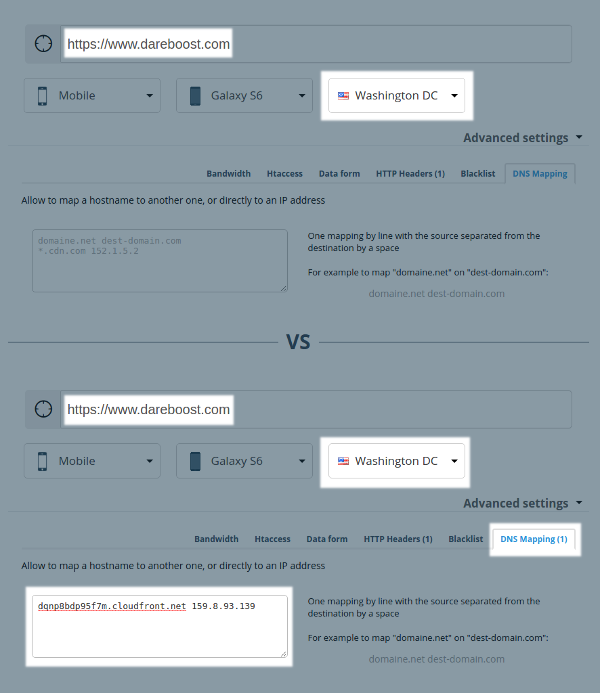 As pointed out by this comparison report, we notice – as expected – that disabling our CDN via a DNS mapping is slowing down the page loading time from the USA. You could do even more thanks to this DNS Mapping feature, as you are not limited by a domain/IP address mapping. As an example, you can set a mapping from one IP to another IP or from a domain to another domain. This new feature is available by now for all of our customers. Do not wait any longer to test it as it may open new perspectives for you and the ways you uses our service! The DNS Mapping option is available for on-demand analyses, comparisons, monitoring and even via our API.